The COFFEE VAULT - 12 oz by Friis keeps your coffee fresh. Full flavor starts with fresh coffee. The Friis Coffee Vault -12oz blocks out light, air and moisture to seal in flavor. The Friis Freshness Valve vents away continuous CO2 gases that are a result of the coffee roasting process. Stored in a cool, dry place, your coffee stays rich and full of flavor. Simply put, the Friis Coffee Vault keeps your coffee fresh longer. Before You Brew Your Coffee...Store it Properly. 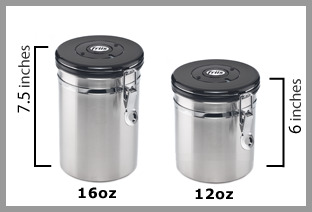 The Friis Coffee Vault - 12oz features a stainless steel base with an all black BPA free polymer lid. It measures 6"H x 5"D. It holds 10-12 oz (3/4 pound) of whole coffee beans or 10-12 oz of ground coffee. Also included is a measuring spoon, one year supply of Friis freshness valves, getting started instructions and the Art of Flavor booklet. Includes: Free One Year Supply of Friis Freshness Valves.